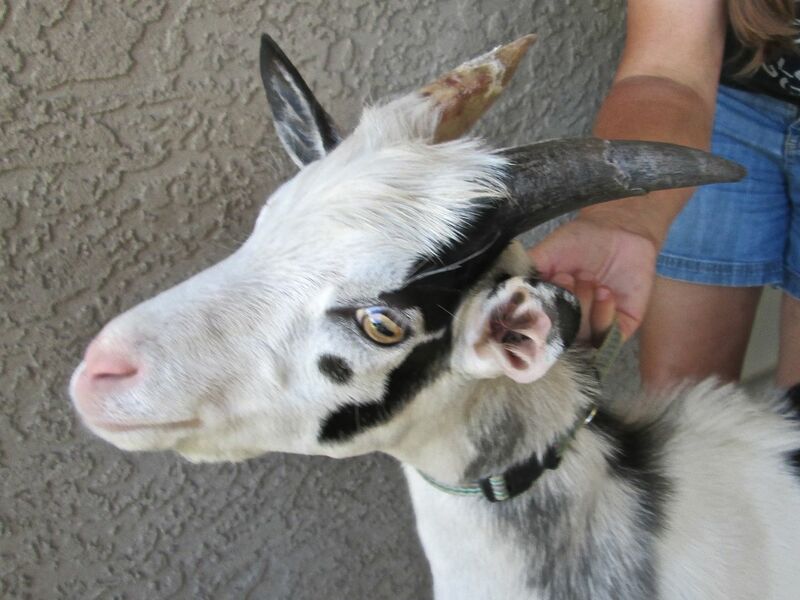 It was a bittersweet day at Goat-O-Rama. Today we said goodbye to Crockett and Boone, two of our first kids from 2016. We were happy to see them go to a good home where Crockett will be a herd sire and Boone will be his sidekick wether companion. 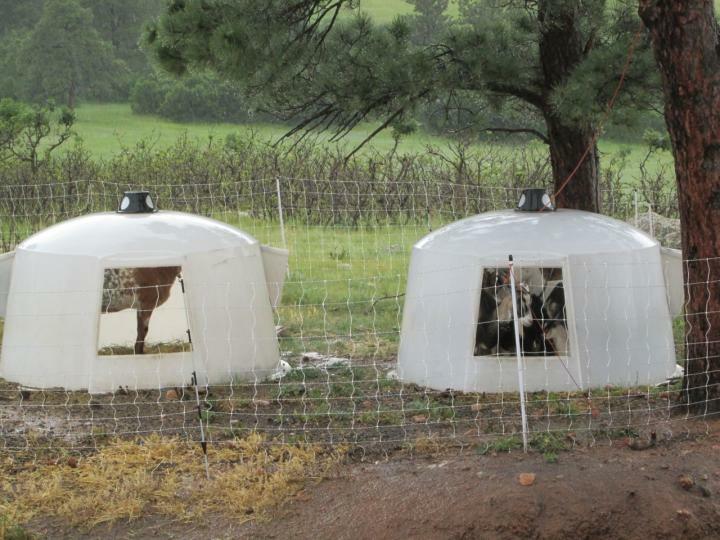 The lovely folks who bought them are getting into goats for the first time and want to start a little dairy herd. Crockett and Boone are their first purchases. I hope it goes very well for them. 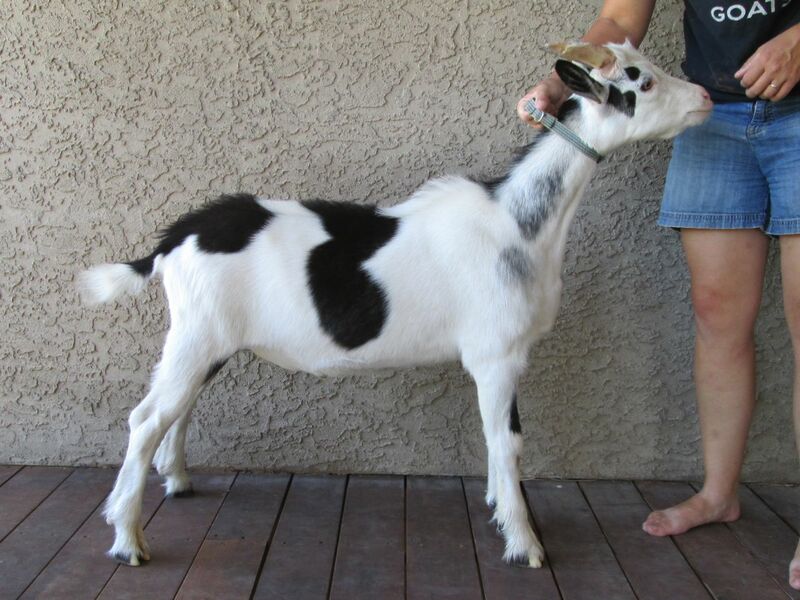 I also hope Crockett passes nice color to his offspring. As for me, I’m going to miss these boys’ funny, mischievous faces and rambunctious, affectionate attempts to still sit on my lap despite weighing nearly 70 lbs. apiece. I’ll especially miss Boone, who would grin at me and ask me to rub his soft little nose and cheeks. He’s going to make a very good wether. 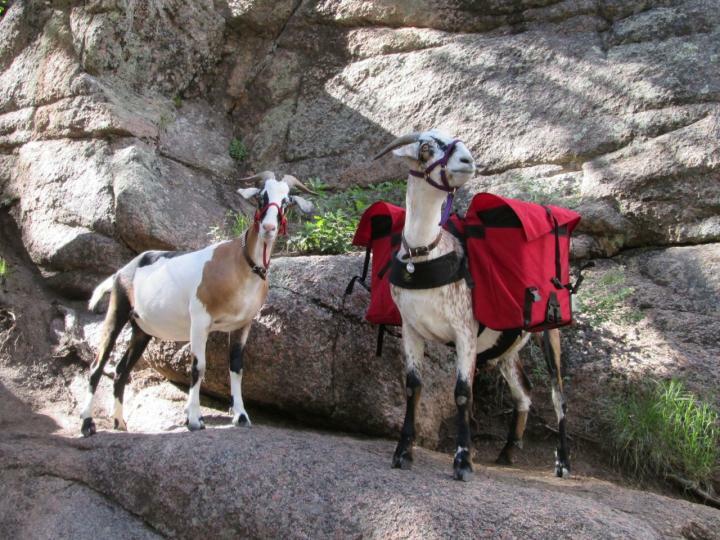 Packgoat Fun Day at Rye Park! 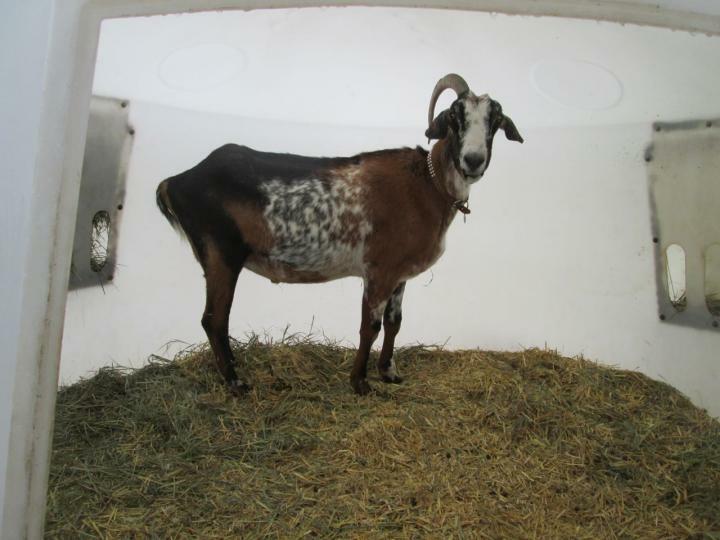 Last Saturday Phil and I hosted a Packgoat Fun Day at Rye Park. It was not a very large gathering because a few people had to bow out at the last minute, but James and Deirdre who bought Snickers, Sledge, and Hammer from us last year were able to make it! They brought Snickers with them and my how he’s grown! 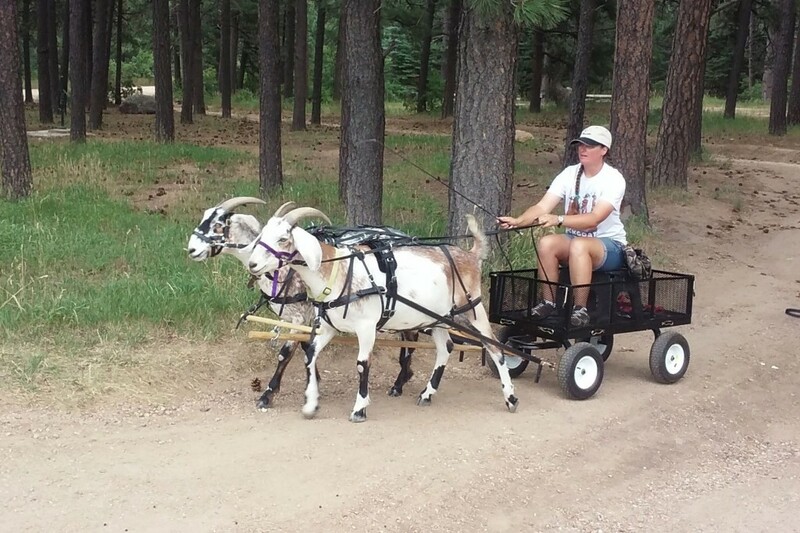 I had started him to driving last year before we sold him and I wanted to see if he would pull the wagon with Sputnik. They made a great pair! You’d think Snickers had been pulling this wagon his whole life! He drove right off and thought nothing of it. He sure makes a flashy pair with his brother Sputnik! 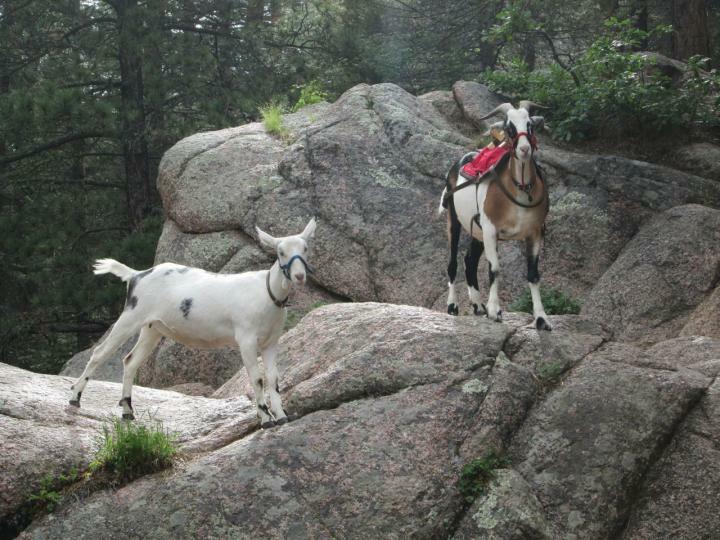 After the drive, we went for a short hike around the park with the packgoats. The other folks picnicking in the park were quite intrigued by our little cavalcade. We picked up a bit of trash before heading home. It was a fun day. I think we’ll have to do some more of these! We went to the water slides again yesterday with some friends, this time just to play! I gave Sputnik a well-earned break and made Finn do the work this time. He was a trooper, but I’m not sure he was quite as proud of his job as Sputnik. Finn stowed Tigerlily along with him. 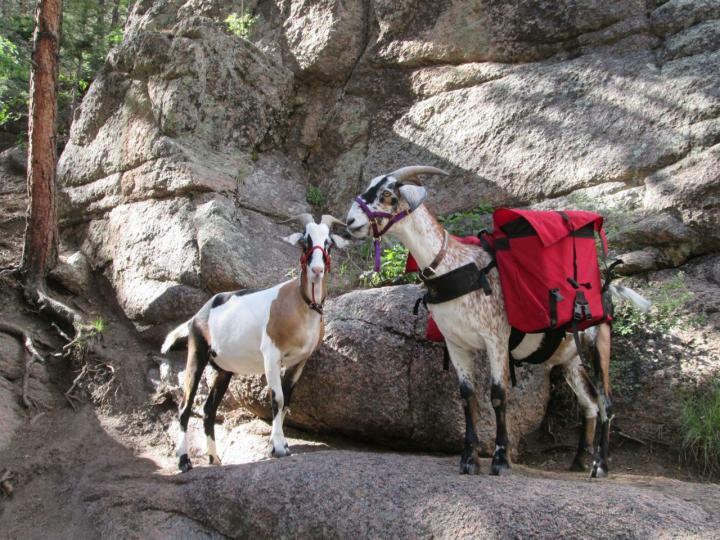 Can you see her peeking out of his pack? Here’s our girl! She is as athletic and gung-ho as her father, Finn. But she HATES water! The first little creek crossing was just a toe-wetting along the very edge of the creek where a cliff came down to meet the water. She started to follow me then suddenly turned and tried to scale the cliff. She hit the end of the leash with a snap before I could react and came tumbling back down where she landed with a splash on her belly in two inches of water. It was very traumatic! Her worst fears about the horrid liquid were confirmed–water is wet! 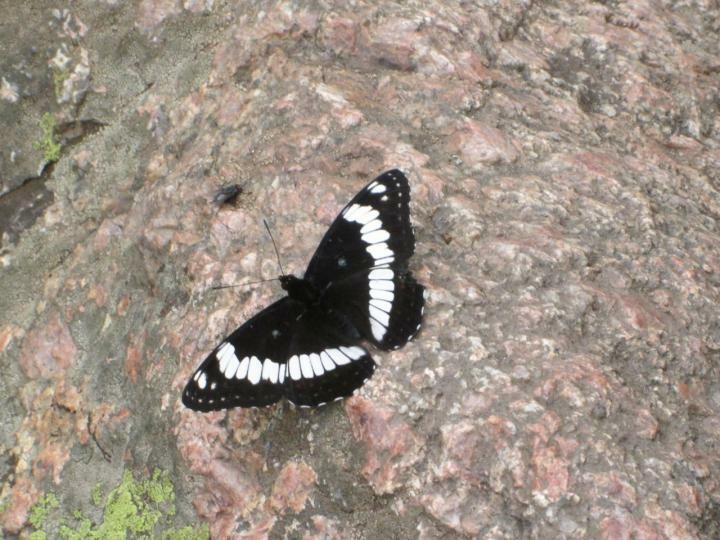 We saw some lovely butterflies along the trail. Shortly after the butterfly sighting we had to cross the dreaded creek. It’s a somewhat tricky bit where you can cross to one side on a single long, smooth rock shaped like a fallen log, then you double back and have to cross through the water and some stepping-stones. I don’t like the stepping stones part. It’s much too rough and slippery. The pool below the big crossing rock is about thigh-deep if you skirt the edge of it. This is the place where Sputnik showed his water bravery yesterday. Tigerlily, on the other hand, made a spectacle of herself. Finn was being reluctant about the water himself, so I put him on a leash and made him follow me. I tied Tigerlily to the back of his saddle and expected her to follow. She did at first and even plunged into the “deep” water. Unfortunately she didn’t follow Finn onto the big rock when we got to it. She panicked and plunged and decided to try to escape to shore through the pool instead. She very quickly ended up in water over her head and was hanging by the halter from Finn’s saddle. Finn wisely stopped and stood still as a statue while I untied the unfortunate Tigerlily. I couldn’t lead her back where we came from to the easy water exit because Finn was standing in the middle of that narrow rock and I didn’t want to try backing him up in that slippery place. 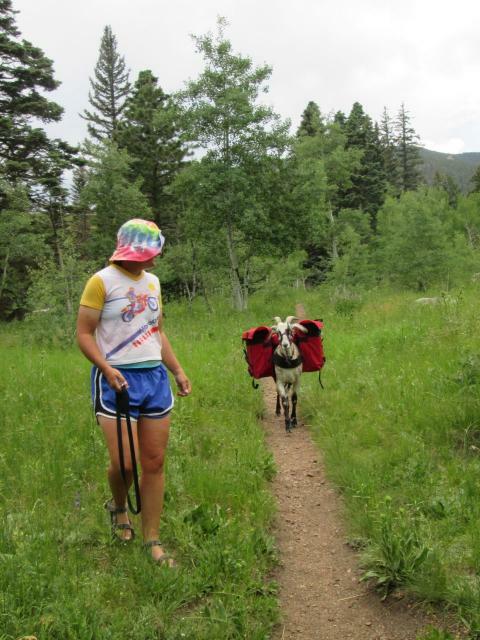 With nowhere to go but forward, I towed the now-pathetically baa-aa-ing Tigerlily behind me through the deep water. She apparently gave herself up for lost at this point because she didn’t even try to swim but instead collapsed like a dead thing, bobbing limply along in the water. She was heavy, but I got her to the exit point where I needed her to climb. She had nothing to push off of underwater because it was too deep, and she wouldn’t kick against the water or clamber with her front legs but just laid there baa-aa-ing and refusing to move. So I braced my feet on the rock and hauled her out by the the collar like a big fish. Once she was on shore she immediately came to life and stopped crying, but we’re going to have to give her some better water experiences very soon after this! 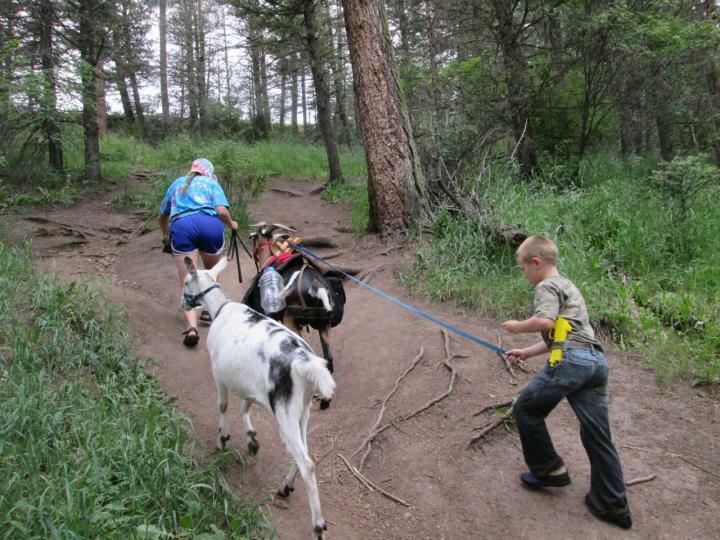 There’s a steep hill at the trailhead, and the youngest member of our crew didn’t think he could climb it without help. So I put a leash on the back of Finn’s saddle and told him to hang onto it. Finn towed him up quite easily. 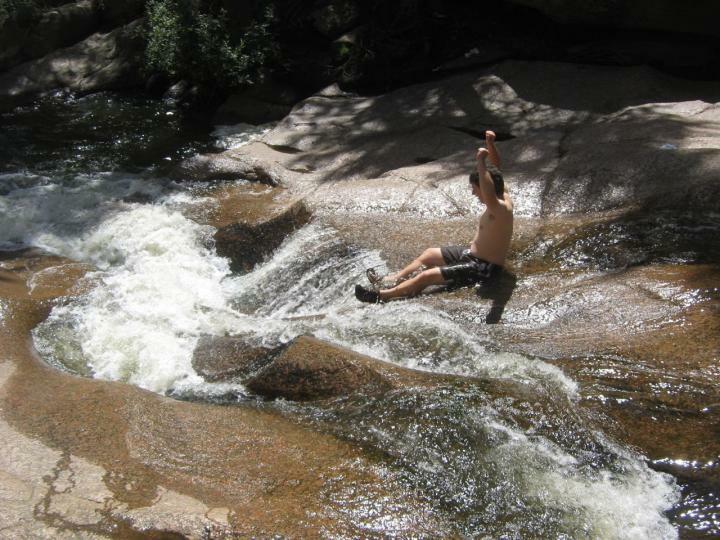 Yesterday afternoon, Phil and I loaded up Finn and Sputnik and went for a hike to the natural water slide. 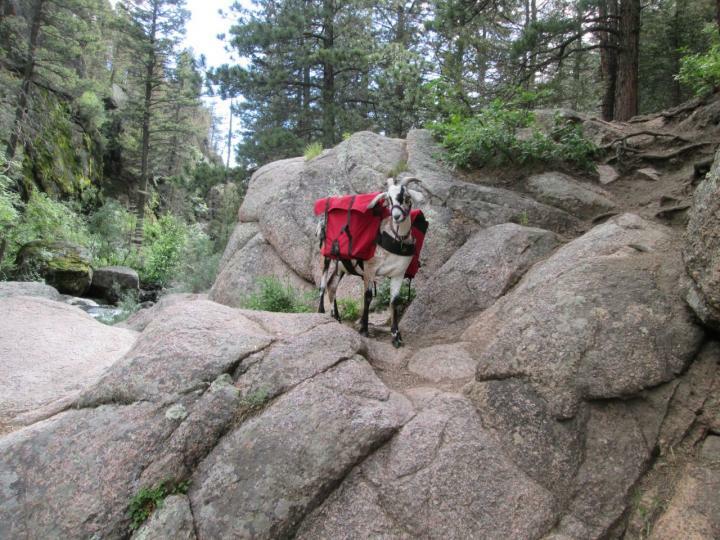 I fastened the Sopris pack on Sputnik as his back is now easily long enough to carry it comfortably. I slid the trash cans into the panniers because we had a mission: to clean up this beautiful trail that is too often used as a garbage dump by people who should know better. Sputnik carried the pack like a champ. 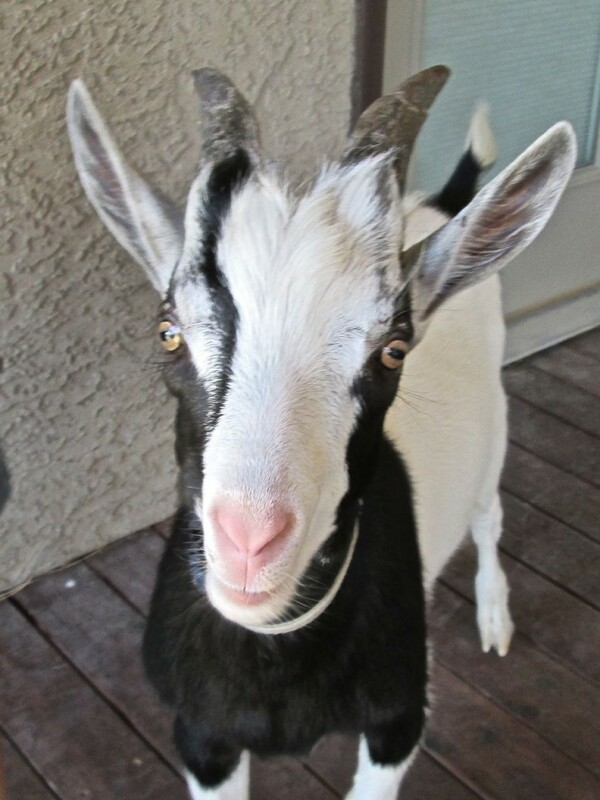 This goat has really come into his own this summer and is no longer the skittish little guy who jumps at every touch of my hand. He stood perfectly while I saddled him and didn’t flinch when I tightened the cinch or even the britchen. He didn’t even spook when I slid the trash cans into the panniers. 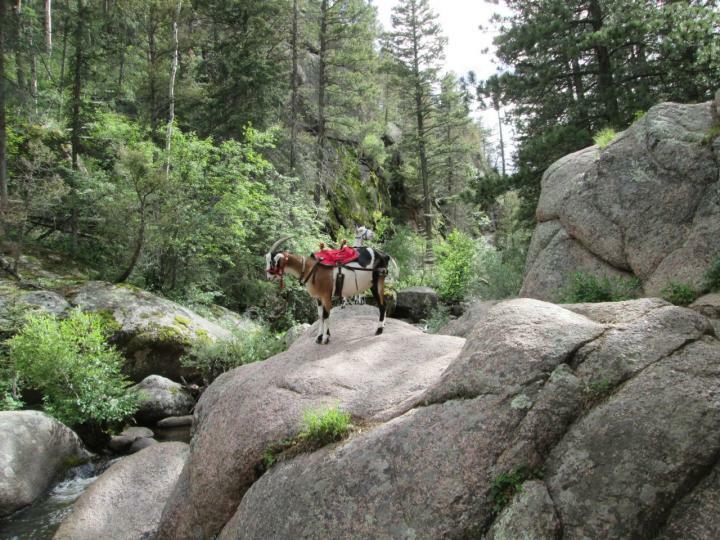 He was a little unsure of himself at first because the wide pack kept hitting trees and rocks in narrow places (and this trail has a LOT of narrow places! ), but he soon got used to it and even learned very quickly when a spot was too narrow and he had to go around or over instead of through. It’s obvious to me that Sputnik really, really likes having a job. It makes him feel important and he takes his work very seriously. 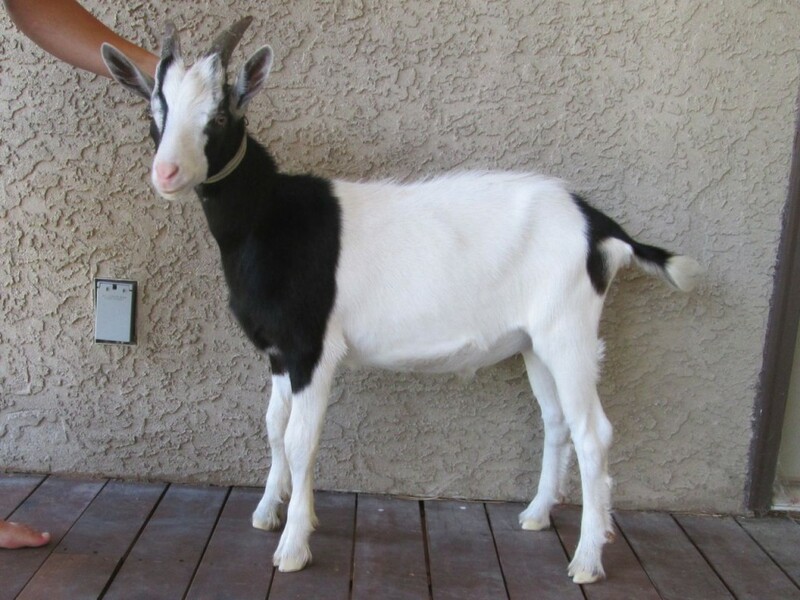 He even posed for a few photos–something I’m not at all used to with this goat. 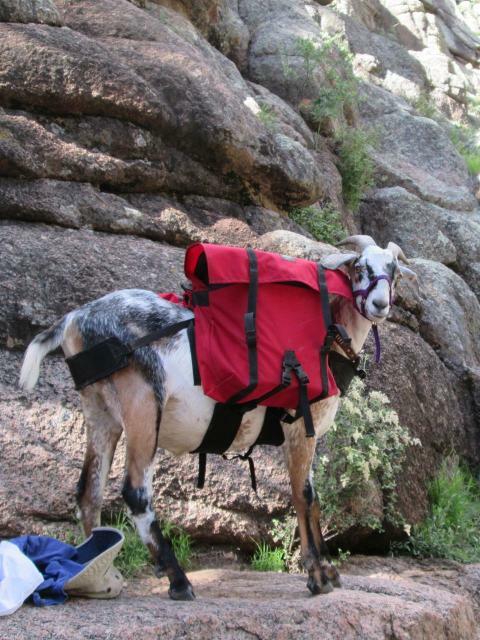 I’m pretty sure that with this one hike his self-esteem just tripled. Finn came along too, but he was useless–he didn’t have a pack on at all and he spent the whole time goofing off. 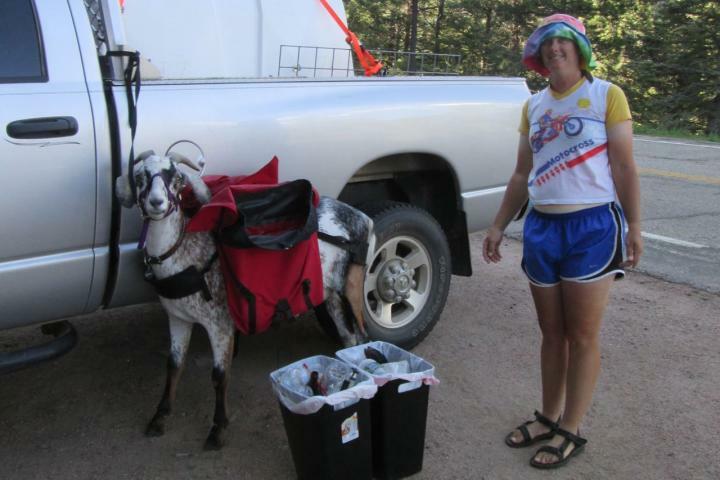 By the end I had filled both panniers with garbage–mostly plastic water bottles and granola wrappers, but also a few odd things. The nastiest was a discarded pair of underwear that had been partly shoved under a rock. I can only imagine why. I picked that one up with a long stick. Luckily I remembered to line the trash cans because even a trash can shouldn’t touch some things. 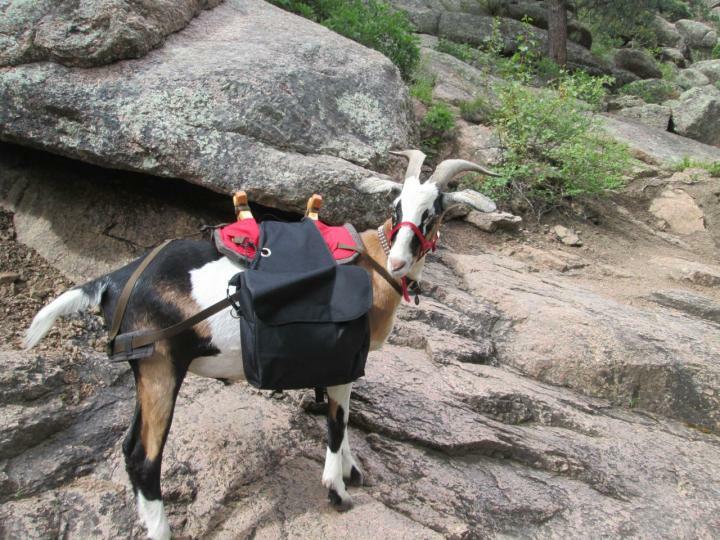 This trail has several water crossings, and I was impressed with Sputnik’s bravery. He hesitated the first time, but after that he never missed a beat. There was a spot on the way back where Phil was carefully crossing from stone to stone with a hesitant Finn in tow. I knew that Sputnik with his big packs would have a hard time negotiating that route, so I decided to take him right through the creek. I jumped off a boulder into thigh-deep water, expecting to have to pull Sputnik in after me. But before I walked far enough to tighten the leash, I heard a tremendous splash as he plunged in after me, garbage cans and all. Such a change from the Sputnik who panicked in the lake at Rendy last year or who had to be physically dragged into the pool at Calf Creek Falls last October! 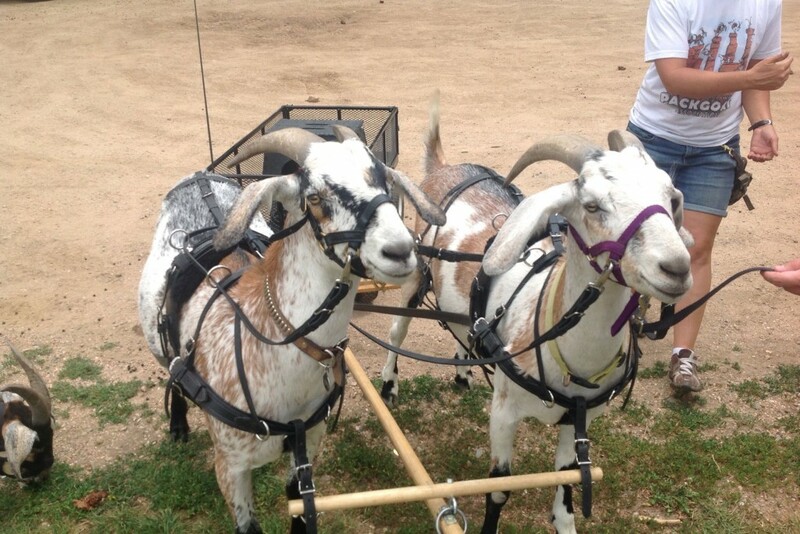 The Goat Team’s First Parade! 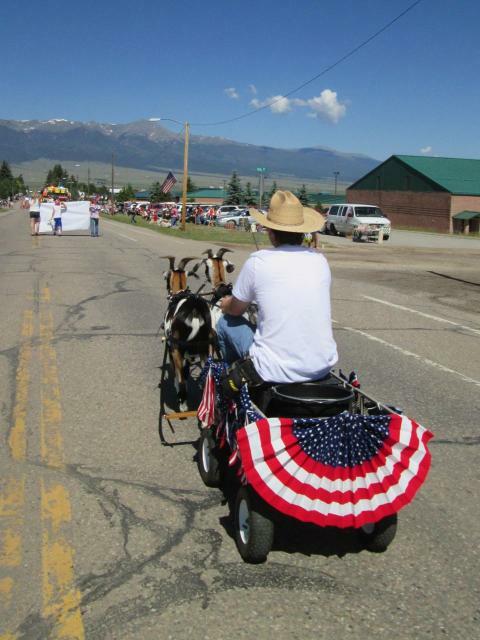 I was so excited about driving our team in the upcoming 4th of July parade in Westcliffe that I hardly slept a wink all night, and much like Christmas, it did not disappoint but even surpassed my anticipatory expectations. The boys were clipped on Sunday afternoon between chilly rainstorms, but by the time the weather cleared it was much too late to give baths. So I was up bright and early this morning to get them bathed and Show Sheened before the parade. I was afraid Sputnik would spend all 4th of July hating me after his first clip and bath, but he actually did quite well and seemed to enjoy having the water sprayed in his face. He kept slurping at it. This skittish little guy has sure come a long way! Finn looked amazing today. He’s never been clipped and bathed before and the white in his coat was a blinding contrast to the glittering black on his hindquarters. And his black hindquarters did literally glitter. His hair has a very slight crimp to it that caught and reflected the sunshine. I’ve never been so proud of my boys. They were real head-turners and they got a lot of nice compliments today. The boys were nervous about all the noise and excitement and crowds, but there were no stops or spooks and I didn’t once have to run to their heads to help Phil handle them. 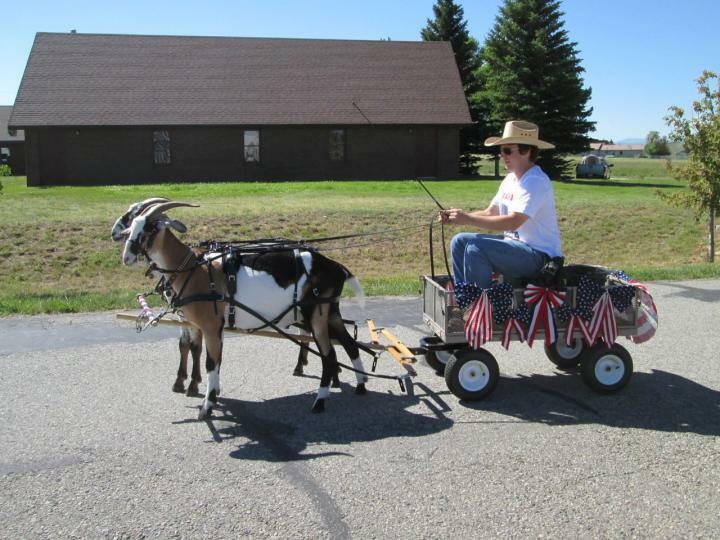 He drove them by himself the whole time while I walked behind the wagon throwing candy to the kids. 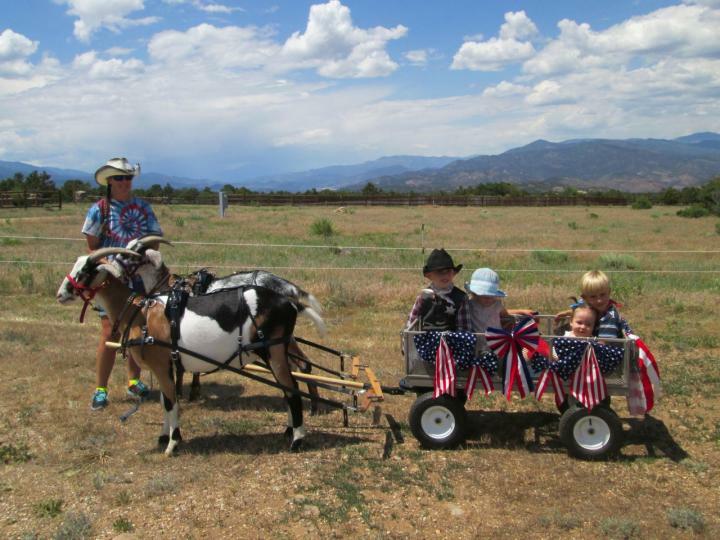 The wagon is the perfect size for stowing a five-gallon horse bucket of candy behind the driver’s seat. I was so busy tossing candy every which way that I hardly got to watch how the boys went, but I know they didn’t stop even once. 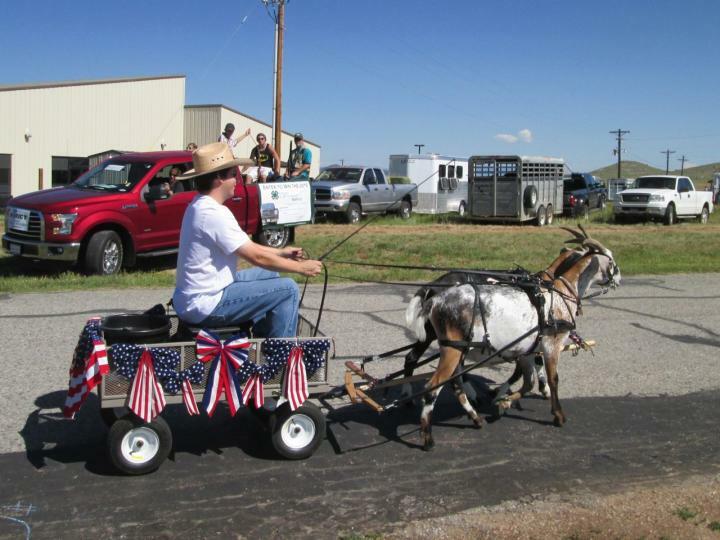 Phil drove them quite expertly so that we didn’t have to start and stop the way we usually do in parades. He kept them a good distance from the people ahead of us, and he’d slow their walk if he saw the parade stop, then speed it up a little to close the gap if necessary. There was a loud Camaro behind us and it never bothered the boys to hear it revved. Phil did have to continually encourage them to keep walking once we got among the noisy crowds, but they never balked or tried to turn back. 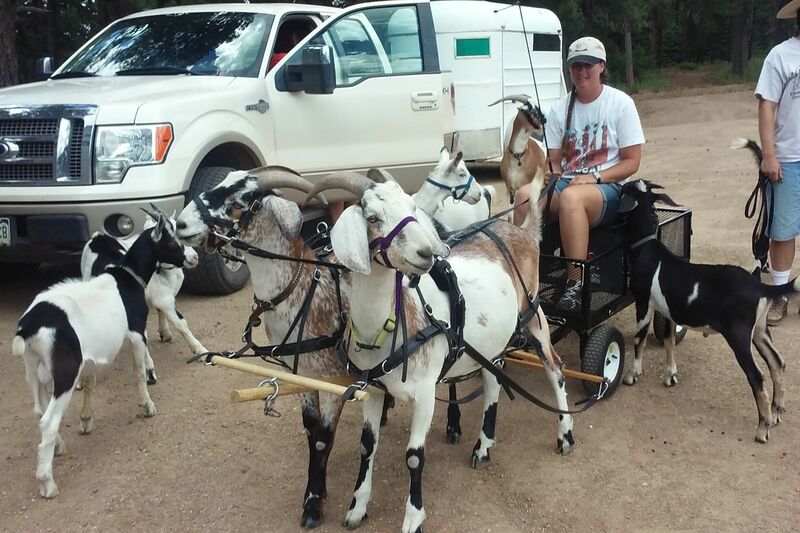 The goats were perfect, but I had a near-disaster. We were in the thickest part of the crowd and I was running frantically back and forth so as not to skip any candy-craving kids and I didn’t even see the massive horse pile under my nose. I felt my foot hit something soft and heavy and I pitched face-forward right toward the splattering wet mess I’d just kicked in front of me. There was a brief second of panic before my second foot caught up and saved me before I actually made contact. The crowd was cheering, but not nearly as loud as I know they would have if I’d actually fallen face-first into horse poop. Thankfully my shoe was the only casualty. 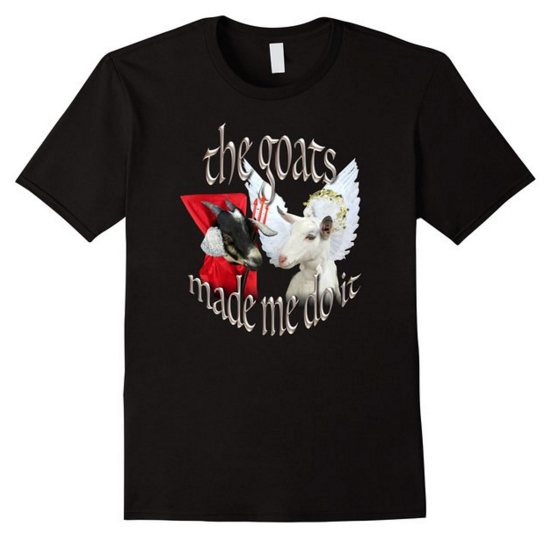 Gee, I like goats! They poop in neat, dry little pellets. So without further ado, here are a few photos. 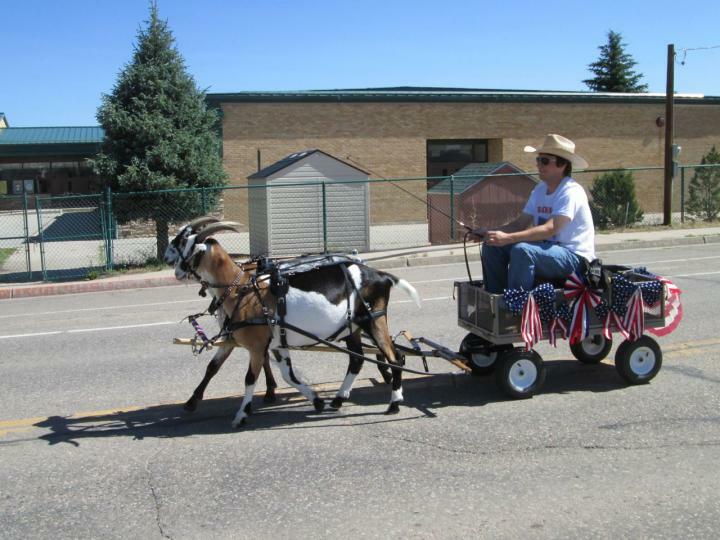 One nice thing about this parade is it’s all downhill. It’s not steep, so the boys didn’t have to hold the wagon back, but it made the pull very easy for them. After the parade we went to my parents’ place and had a 4th of July picnic while the goats lounged in the shade of some scrub oak trees. Afterwards we hitched them up again and took my nephews and nieces for a ride. Sputnik was not at all thrilled about having to return to work, and I kept having to nag at him to keep up and not drag me toward the truck, but he got through it and the kids were delighted. We had a sudden heavy cloudburst this afternoon. 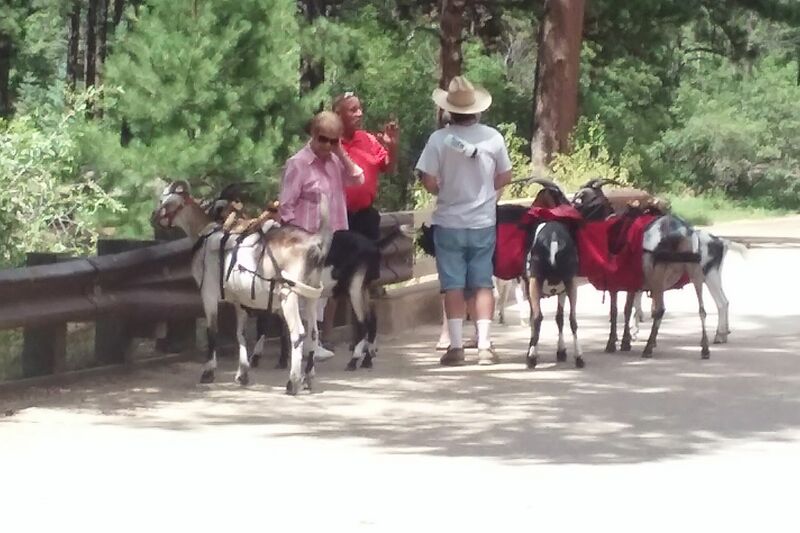 All the goats scurried toward the two closest shelters. There was a slight problem with distribution. 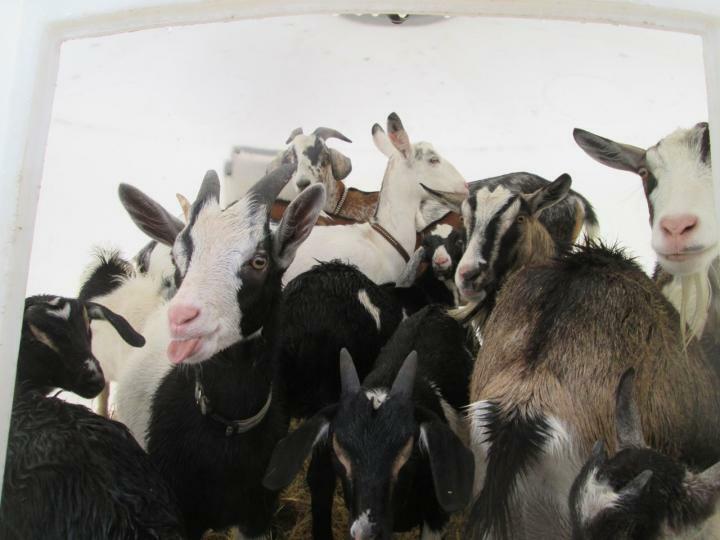 Yes, there were FIFTEEN goats crammed into this shed! Two of them burst out through the seams before I managed to snap the picture. But if there was any doubt about whether Cuzco is still king, let these photos put the question to rest.